Welcome to Oviedo's best kept secret on exclusive and private, Long Lake. 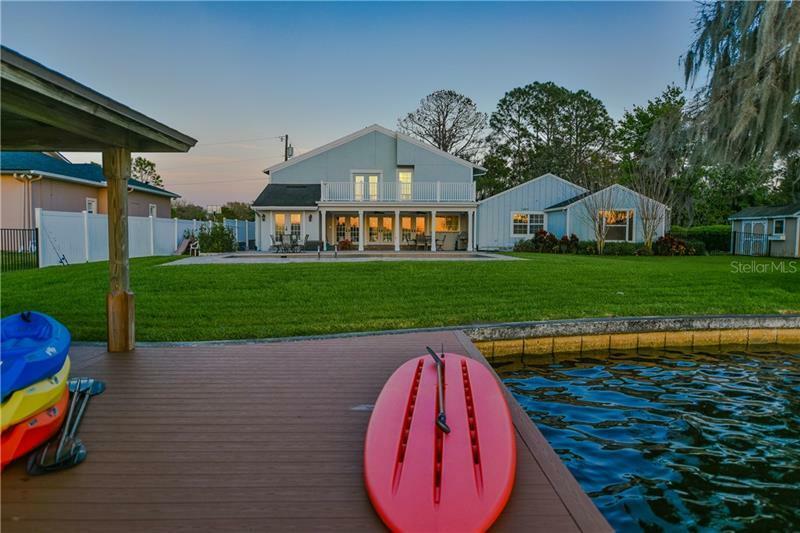 At the end of Carolyn drive, this gorgeous custom home has 111' of water frontage, and a total of 1.6 pristine acres. The inside is as beautiful as the outside with newly installed wood plank tile, double height ceilings, extensive moldings, a kitchen with VIEWS including 42" white cabinetry, under cabinet lighting, subway tile backsplash, butcher block island, and gas stove. Downstairs includes two beautifully remodeled living spaces, off the kitchen is a retreat with (3) bedrooms, (1) bathroom and a living room. Almost every single room overlooks the stunning lake views. The expansive master suite is located upstairs and includes separate sitting space, upgraded master bath with double vanities, walk in closet and VIEWS. French doors lead to a large balcony where you can survey your entire property and sweeping lake views. Outside amenities include oversized pool, huge brick paver patio, private boat dock and lift and so much space to run around. Updates include: Downstairs AC unit, new compressor unit, new evaporation coils, new accumulator (2018). Septic tanks (3) and drain field completely replaced (2017). Dock expanded and composite decking installed (2017) New hot water heater (2014). Downstairs bed/bath area was taken down to studs, completely remodeled and reconfigured, spray foam insulation added, complete re-wiring of electrical and re-plumbed (2014). Roof (2012).